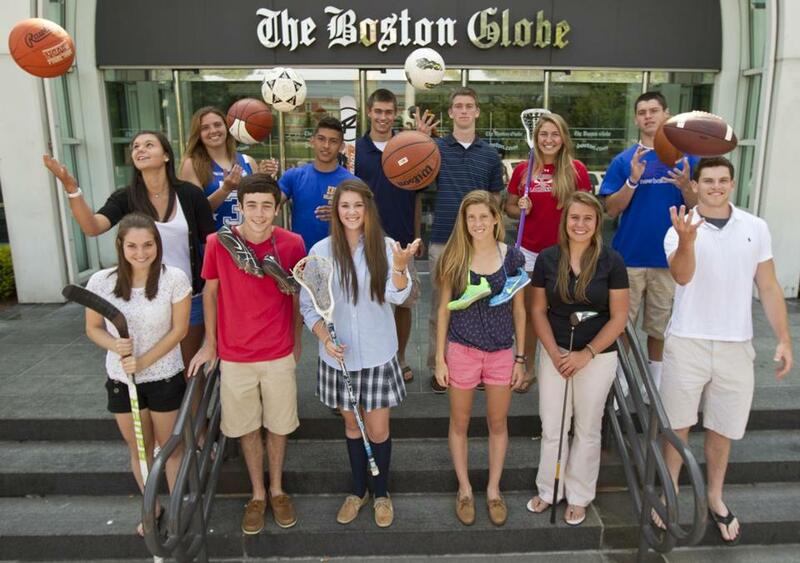 The 2012 Boston Globe/Richard Phelps Scholar-Athletes: Back row, from left, Fairhaven’s Kara Charette, East Boston’s Maria Delvecchio and Carlos Ruiz, Hingham’s Simon Merryweather, St. John’s Prep’s DeKlan Robinson, Lincoln-Sudbury’s Madison Acton, and Everett’s Jonathan DiBiaso. Front row, from left, Dedham’s Tara Celata, Somerset Berkley’s Thomas Carroll, Lowell Catholic’s Shelagh Brice, Cambridge’s Emma Payne, Tantasqua’s Olivia Brooks, and Marblehead’s Will Quigley. Quigley was named captain of both the football and baseball teams in his senior season and is a three-year NEC All-Star for football. The running and corner back graduates as Marblehead’s all-time leading scorer with 46 career touchdowns. One of the top lacrosse players in the country, Acton is a two-time All-Scholastic and a three-time DCL All-Star. She’s also an all-star in soccer and track. Acton is ranked the No. 2 midfielder in the Nation by ESPN for the class of 2012. The state’s football player of the year, DiBiaso led Everett to consecutive Super Bowl titles, breaking records along the way. A two-time All-Scholastic, he set a state record with 103 career TD passes. After Exeter, he’ll attend Dartmouth. Payne was an all-star runner at Cambridge, earning captain honors in cross country and indoor and outdoor track, while also being named a Greater Boston League All-Star in all three sports. Payne ranks 10th in her class of 362. Merryweather is the reigning state ski champion in the giant slalom. He also led the soccer team to a Patriot League title and the outdoor track team to the Div. 3 crown, where he was a member of the record-breaking 4x100 relay team. Celata will graduate as Dedham’s valedictorian. The Bowdoin-bound Celata was named Dedham’s Female Athlete of the Year, after receiving Bay State All-Star honors for field and ice hockey while also being amember of the track team. Carroll served as two-year captain for the indoor and outdoor track teams, while also earning captain honors for golf his senior season where he was the team’s top player. Carroll was an EAC track all-star and was ranked fourth in his class. Flynn is a Central Mass All-Star in football, basketball, and baseball, while also being captain of each team his senior year. The BC-bound Flynn is ranked ninth in a class of 124. He is a three-year member of the National Honor Society. Brooks is a Worcester County All- Star in basketball, softball, and golf. She was named captain of each team her senior season and was namedMVPof the boys’ golf team. She finished ninth this spring in the girls individual golf tournament. Robinson was named St. John’s Athlete of the Year after being namedMVPof the soccer and outdoor track teams and breaking a school record in the high jump during the indoor season. He was a National Merit semi-finalist. Brice was named captain of the cross country, basketball, and lacrosse teams her senior year, while receiving Catholic Central League All-Star honors in basketball and lacrosse. She is also vice-president of National Honor Society. Ruiz is a two-year captain of the East Boston soccer team, a threeyear teamMVP, and was named All-New England by the Coaches Association. Ruiz ran track in the spring and was a city all-star after winning the 800 at the city meet. Delvecchio was namedMVPof the Jets’ basketball team and a city all-star after averaging 16 points, 15 rebounds and four blocks per game. Delvecchio was also a captain of the volleyball team and a first baseman on the softball team. Amesbury: Daniel Sanderson. Andover: Shannon Tully. Bedford: Kristen Baratta, Elizabeth Watson. Beverly: Erin Silvestri. Central Catholic: Alex Borelli, Ryan Breton. Georgetown: Taylor Nelson. Greater Lowell: Chakriya Bouen, Bradley Dumais. Lincoln-Sudbury: Madison Acton, Matt Cahill. Lynn Classical: Kyle Gauthier, Allison Kurpiel. Lynn English: Sarah Cowdell, Taylor Newhall. Marblehead: Cailin Daley, Will Quigley. Masconomet: Ben Panunzio, Brooke Stewart. Minuteman: Dylan Caples, Wyatt Rojo. Triton: Ryan Clay, Richard Fecteau, Lauren Robert, Bethany Saunders, Demitri Tzitzon. Westford: Will Alden. Whittier: Nick Mazzone, JoAnn Plante. Wilmington: Kathleen Kurowski, James Mara. Winthrop: Joe D’Amore. Cambridge: Kevin Lovaincy, Emma Payne. Everett: Tori Cyrus, Jonathan DiBiaso. Lexington: Nandi Mehta, Chris Shaw. Malden: Emily Hoffman, Rebecca Krigman. Peabody: Thomas D’Amato. Reading: Melissa DalPozzo, Nicholas Guenard, Ashley Testa. Ashland: Leah Flanigan, Christian Navarro. Bellingham: Patrick Williamson. Canton: Chris Murray. Dedham: Tara Celata. Dennis-Yarmouth: Sean Nee. Dover-Sherborn: Matt Heinlein. Falmouth: Greer Gilbert. Harwich: Elizabeth Thompson. Hingham: Simon Merryweather, Shauna Sullivan. Mansfield: Meghan Carroll, Mitch Negus. Marshfield: Joe Hastry. North Quincy: Aris Bega, Tim Liuzzo, Elizabeth Sullivan, Sara Sullivan, Olivia Umoren. Norwell: James Arnold, Allison Weiler. Plymouth South: Elizabeth Pisto. Quincy: Peter Giunta, Kiley Mc- Donald. Rockland: John Mulready. Scituate: Harris Berton, Brenda Keys. Sharon: Vivek Nangia. Silver Lake: Kaitlin Burgess, Bernard May III. Weymouth: Cameron McLevedge, Julie Tevenan. Bishop Feehan: Richard Moschella, Alexis Sells. Bishop Stang: Blaire Gagne, Samantha Wright. Blue Hills: Derek Cahill. Bourne: Drew Girouard. Bristol-Plymouth: Mike Goyette, Bethany Parris. Chatham: Ryan Williamson. Coyle & Cassidy: Megan Ritchie. Dartmouth: Riley Marion, Cali Warner. Dighton-Rehoboth: Emma Klinkhamer, Trace Renaud. Durfee: Rachael Camara. Fairhaven: Kara Charette. Martha’s Vineyard: Jesse Chandler, Kyle Joba- Wood, William Stewart. New Bedford: Jon Finnerty, Brianna Perry. Somerset Berkley: Thomas Carroll. Auburn: Jenna Scanlon. Gardner: Jamison Craft. Groton-Dunstable: Anna Towle. Hudson: Marie Hydro, Evan King. Lunenburg: Jennifer Markham. Milford: Christine Fraga. Millbury: Bryan Dufresne. North Middlesex: Emily Church, Mike Skelly. Northbridge: Jack Green, Emily Matte. Quabbin: Lydia Deneen. St. Peter-Marian: Steve Flynn. Sutton: Mark Hill. Tantasqua: Olivia Brooks, Rachael Smith. Uxbridge: Dan Penza. West Boylston: Chris Benson, Kendra Sloan. Westborough: Anna Petrunich. McCann Tech: Cassie Field. Bishop Fenwick: Lauren Moulton, Chris Poirier. Catholic Memorial: Donovan Henry. Lowell Catholic: Shelagh Brice, John Rafferty. Marian: Trevor Rabidou. St. John’s Prep: Deklan Robinson. St. Mary’s: Michael Sonia, Rachel Stueve. Boston International: Jessie Barbosa, Wuilito Fernandes. Brighton: Eriksson Goncalves. Burke: Shaylim Blackwell. East Boston: Maria Delvecchio, Carlos Ruiz. Latin Academy: Robert Finch, Brian Goff; Fenway: Chandlor Lyles; Boston Community Leadership Academy: James Onuigbo. The 26th annual Boston Globe/Richard Phelps Scholar-Athletes were chosen by Boston.com high school sports editor Zuri Berry, Regional Sports Editor Craig Larson, Assistant Managing Editor/Sports Joe Sullivan, Assistant Sports Editors Greg Lee and Scott Thurston, High School Sports Editor Bob Holmes, and Dave Manzo, the president and executive director of the Cotting School in Lexington. Applications were sent to principals in April and a month later the Globe had the challenge of selecting one boy and one girl from six MIAA districts plus Boston.